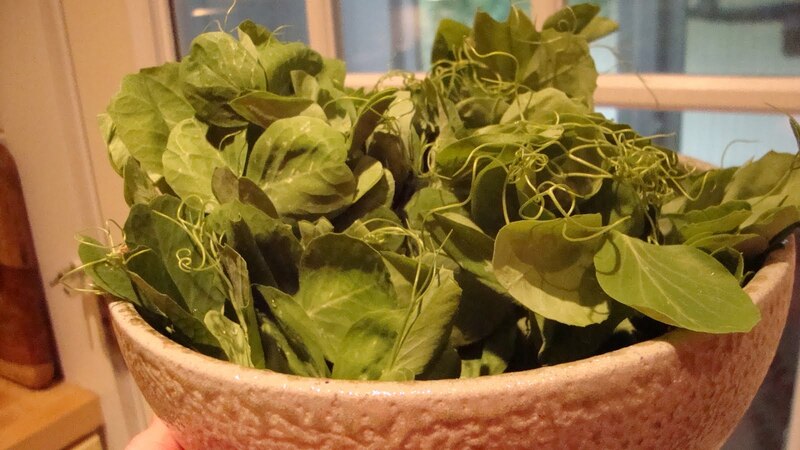 Fresh pea shoots–leaves, shoots, and tendrils from pea plants. Yummy greens. 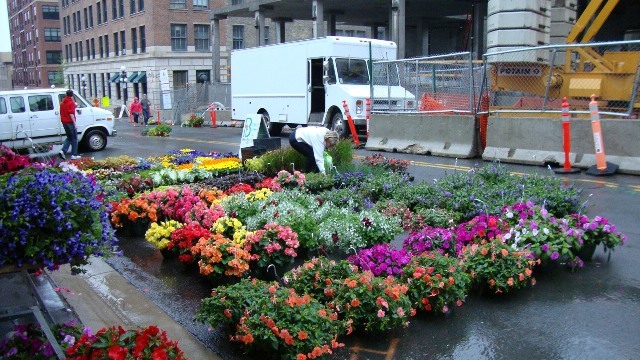 Flowers at the market in downtown St. Paul–a fine way to spend Saturday morning. By the way, that’s friend Sue Hall picking out flowers for her garden! While my husband Dave adores clam chowder, I was looking for something just a bit different for one of this year’s #FishFridays #Lent posts… I thought about it as Rosie slept beside me last night. Yes, she gets cold. I tuck her in. Perhaps a soup with a southwest flair or one with shrimp, which is so accessible all over the U.S.? Shrimp is also a popular frozen seafood buy at warehouse stores in inland cities like Colorado Springs where fresh fish is at a premium. Enter Smoky Green Chile-Shrimp Corn Chowder born just this morning in my kitchen. I like it just as it is, but please adjust the seasonings to suit yourself. Ramp up the amount of chiles or shake in that hot sauce. Add a tad more salt. Up to you. Serve with a nice cold Colorado beer. Pay no attention to Peyton Manning. In Colorado, friends don’t let friends drink Bud. In a heavy 8-quart soup pot or Dutch oven, cook bacon until just crispy at edges or heat butter or oil over medium flame. Add onion, celery, carrots, 3/4 teaspoon salt, and 1/2 teaspoon pepper. Cook, stirring, until vegetables are tender–about 10 minutes. Stir in garlic; cook additional minute. Pour in broth and water +/or clam juice, if using. Bring to a boil; add potatoes, bay leaf, parsley, corn, and chiles. Reduce to simmer, cover partially, and cook until potatoes are tender–10 – 12 minutes. In a large measuring cup, whisk flour into milk until smooth. Slowly whisk milk mixture into chowder and let cook another few minutes until thickened. Add shrimp; bring back to a boil and cook 1 – 2 minutes or until shrimp is firm and pink. Taste and adjust seasonings as needed. Remove bay leaf. Serve hot garnished with minced scallions and a little grated cheddar, if desired. Pass hot sauce at table, if using. *For a really cheesy soup, increase to 6 or even 8 ounces and add all of the grated cheese right into the hot pot of chowder after the shrimp is cooked. Stir until completely melted and taste again just in case. Garnish with just the minced scallions. Note: If using frozen shrimp, let cook an extra minute or so. MAKE AHEAD: Follow directions until #3. Add the milk and cook as noted, but don’t add the shrimp. Instead, cool, cover, and chill up to one day in the fridge. Right before serving, heat soup over low heat slowly to a simmer and add shrimp; continue as directed. Mid 18th century: perhaps from French chaudière ‘stew pot’, related to Old Northern French caudron (see cauldron). This sounds like my kind of chowder! It looks delicious! 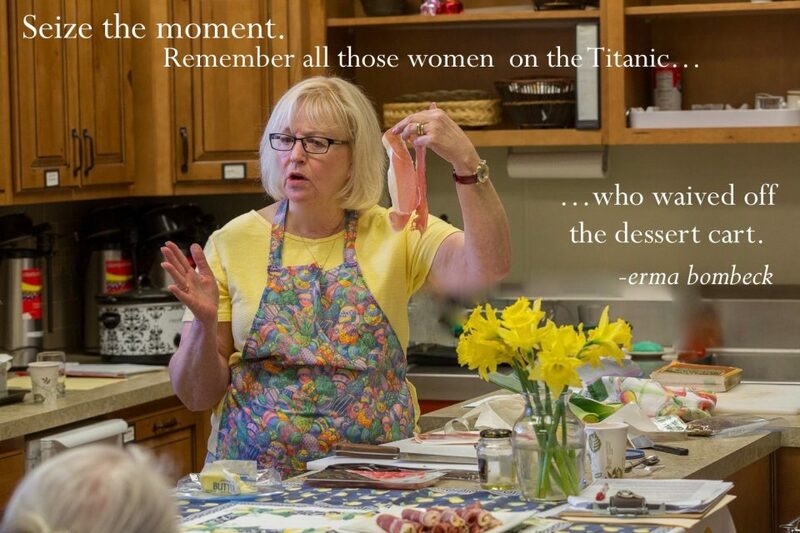 Alyce, I loved the class Friday on Salads! Thank you! This chowder looks like something I want to try! Yummy! What wine would you serve with it? Thanks, Judy! Try an off-dry Riesling. Not too sweet.